Jumbo Jellyfish or Massive Star? (PhysOrg.com) -- Some might see a blood-red jellyfish in a forest of seaweed, while others might see a big, red eye or a pair of lips. In fact, the red-colored object in this new infrared image from NASA's Wide-field Infrared Survey Explorer (WISE) is a sphere of stellar innards, blown out from a humongous star. 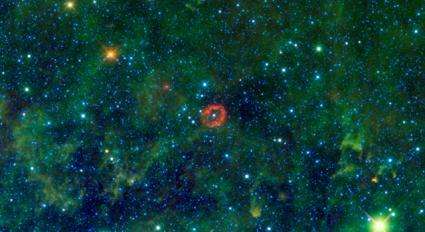 The star (white dot in center of red ring) is one of the most massive stellar residents of our Milky Way galaxy. Objects like this are called Wolf-Rayet stars, after the astronomers who found the first few, and they make our sun look puny by comparison. Called V385 Carinae, this star is 35 times as massive as our sun, with a diameter nearly 18 times as large. It's hotter, too, and shines with more than one million times the amount of light. Fiery candles like this burn out quickly, leading short lives of only a few million years. As they age, they blow out more and more of the heavier atoms cooking inside them -- atoms such as oxygen that are needed for life as we know it. The material is puffed out into clouds like the one that glows brightly in this WISE image. In this case, the hollow sphere showed up prominently only at the longest of four infrared wavelengths detected by WISE. Astronomers speculate this infrared light comes from oxygen atoms, which have been stripped of some of their electrons by ultraviolet radiation from the star. When the electrons join up again with the oxygen atoms, light is produced that WISE can detect with its 22-micron infrared light detector. The process is similar to what happens in fluorescent light bulbs. Infrared light detected by WISE at 12 microns is colored green, while 3.4- and 4.6-micron light is blue. The green, kelp-looking material is warm dust, and the blue dots are stars in our Milky Way galaxy. This image mosaic is made up of about 300 overlapping frames, taken as WISE continues its survey of the entire sky -- an expansive search, sure to turn up more fascinating creatures swimming in our cosmic ocean. V385 Carinae is located in the Carina constellation, about 16,000 light-years from Earth.